If you were searching for themes in the books I read, you would probably first notice the string of authors whose works I love : Bill Bryson, Mary Roach, and Simon Winchester to name a few. You would also find that I read Harper-Collins‘ Best American Science Writing and Houghton-Mifflin-Harcourt‘s The Best American Science and Nature Writing series every year, reflecting my passion for well-written non-fiction. And you might notice, as I recently realized, that I read a lot of books about fish. I got hooked (pun intended) on this topic after reading a number of newspaper and magazine articles about the decline of fisheries worldwide, another looming environmental disaster that generations to come will need to reckon with. Non-fiction writing about fish deals with ecology, biology, gastronomy, evolution, economics, politics, and a host of other topics that are of interest to me. And I love to eat fish. Image from GRID-Arendal, an organization established to support the United Nations Environment Programme (UNEP) in the field of environment. But, you say, “I don’t eat fish, at least not much. Why should I care about global fisheries?” And, if like most of my site visitors, you live in these United States where beef is king, you are probably right. But for a millions around the world, particularly in Asia and a large swath of central Africa, fish is a primary source of animal protein (see map). These are some of the most populous, and politically unstable, countries on earth. A threat to their food supply should be taken seriously. Without a healthy global fishery, famine would become widespread across the already impoverished continent of Africa, and Asian nations just emerging from decades of poverty would could face political turmoil from a hungry populous. Cod: A Biography of the Fish that Changed the World by Mark Kurlansky: Atlantic cod is perhaps the perfect fish for the human palate: it tastes of the sea but not overly so, flakes nicely with a fork when cooked properly, and works well with many kinds of spices. And for this reason, Atlantic cod is one of the most popular commercial fishes ever, fished at un-sustainable levels through the latter half of the twentieth century. The story of cod is the story of human civilization, and our attempts to live with nature’s bounty without over-exploiting nature. Four Fish: The Future of the Last Wild Food by Paul Greenberg: Tuna, Sea Bass, Salmon, and Cod: the four mainstays of our ichthyological larder. In the U.S., these four fish account for a large part of our commercial catch, along with shrimp and the other popular crustaceans. But, to a degree, they face increasing threats from over-fishing. Greenberg examines the economics, history, and ecology of our fisheries, delivering a full plate of information about the long-term viability of our fisheries. 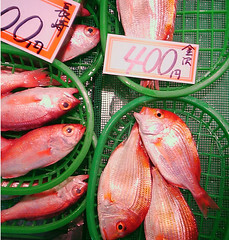 Greenberg explores how consumer decision can help to preserve the bounty of the seas. Greenberg doesn’t offer all the answers, but his cogent prose inspires further exploration of a very complicated topic. Still casting about for more books about fish? There are, perhaps not surprisingly, books about almost every type of commercially important fish, mollusk, and crustacean, usually with a good bit of insight into the lives of fisherman, fishing communities, and the economy of fishing. The Sushi Economy: Globalization and the Making of a Modern Delicacy by Sasha Issenberg: I love sushi, as do millions of Americans. But how did a country known for its conservative food preferences, the birthplace of the bland Big Mac, fall in love with raw fish with rice, seaweed, and impossibly potent green Japanese horseradish, wasabi? Issenberg takes readers on a search for the historical roots of our love for sushi, to the secretive world of Japanese seafood markets, and the mechanized trawlers that bring the delicate cuts of tuna to your local sushi bar. It is a fascinating story, taking on the gastronomic and economic facets of sushi. The Big Oyster: History on the Half Shell by Mark Kurlansky: New York, affectionately known as the Big Apple, could rightly be called the Big Oyster. Kurlansky’s book chronicles the history of New York and the abundant mollusks that made the city viable. Long before they were a delicacy, oysters were working class food, their sheer abundance making them a staple food for early Gothamites, before it could rightly be called Gotham. As refrigerated transport and canning became practical, New York oysters beceame a delicacy, with Blue Point oysters the standard by which all others were measured. Fascinating reading for any New Yorker, or any oyster lover. Beautiful Swimmers: Watermen, Crabs and the Chesapeake Bay by William W. Warner: Warner’s Pulitzer Prize winning book draws readers into the lives of Chesapeake crabbers. While their work may not seem dramatic as the high-seas fishermen seen on The Deadliest Catch, Chesapeake crabber’s work is every bit as perilous, grueling, and little understood or appreciated. Warner’s prose is superb. The Secret Life of Lobsters: How Fishermen and Scientists Are Unraveling the Mysteries of Our Favorite Crustacean by Trevor Corson: My father lives in Maine, so this book was personally very interesting to me, having visited the state many times, and eaten many a lobster roll in the state. Corson focuses on lobstermen on one particular island, Little Cranberry off the coast near Bar Harbor. After reading this book, I’ve come to appreciate of the tough life lobstermen live, and understand why it costs so much. Plus, I think I can tell a male from a female lobster. I still am squeamish about cooking one, though. Kraken: The Curious, Exciting, and Slightly Disturbing Science of Squid by Wendy Williams: Who knew there was so much to know about squid? The most surprising thing is the findings that they are very intelligent creatures, possibly on par with dolphins. Think about that, next time you eat calamari. And finally, if you just want a good yarn about the sea, Sebastian Junger’s The Perfect Storm: A True Story of Men Against the Sea is hard to beat. Absolutely a page-turner, and well deserving of the Hollywood treatment it received at the hands of Wolfgang Peterson back in 2000. The book is better, though, as usual. I’d love to hear if anyone else has been reading about fish, or any other arcane topic. Look for a new post in a couple of days, with my 2012 reading wrap up, and my reading plan (yes, a PLAN!) for 2013. This entry was posted in Books & Reading and tagged books, Environment, Food, global fisheries, postaweek2012. Bookmark the permalink.